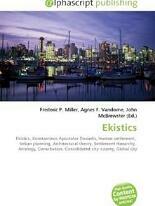 The term Ekistics applies to the science of human settlements. It includes regional, city, community planning and dwelling design. It involves the study of all kinds of human settlements, with a view to geography and ecology - the physical environment- , and human psychology and anthropology, and cultural, political, and occasionally aesthetics.As a scientific mode of study is currently found to rely on statistics and description, organized in five ekistic elements: nature, anthropos, society, shells, and networks. It is generally a more academic field than &quot;urban planning&quot;, and has considerable overlap with some of the less restrained fields of architectural theory.